Graduation is an innately stressful event. While you’re probably excited, and likely relieved, to finally be receiving your degree, the uncertainty of adulthood can be terrifying. Some soon-to-be college graduates are anxious about where they’ll be living after college. However, everyone is collectively freaking out about how they are going to find their first full-time job after college. Although internships are the foundation for a professional career, you might not be offered a full-time position at your current company. Plus, not everyone has the opportunity to have an internship during their last year or two of college. Needless to say, transitioning from any student job to a professional career can be a rough progression, especially when some of your friends have already been offered full-time positions with startup companies months ago. Thankfully, there are some valuable strategies you can implement to land your first entry-level job. Many universities still offer networking events and job fairs to their graduates. After spending thousands of dollars each year, you should be entitled to a few free professional events each year. These events can range from professional presentations on how you can improve your resumes to seminars teaching you how to use a specific software. However, a lot of these events will focus on actual networking between alumni and special professional guests. Even if a particular event isn’t designed for your desired career, you can still benefit from networking with other professionals. After all, it will help you practice those networking skills. Who knows, maybe an engineering firm needs a public relations manager? If you are planning on moving away from your college town after graduation, you can also search the closest metropolis for career-driven events. Larger cities host job fairs and networking opportunities every now and then. In addition to networking events, you can also join industry-specific associations. If you have a marketing degree, or you’re a marketing student, there’s an American Marketing Association. If you’re looking to get a job in scientific illustration, there’s also the Association of Medical Illustrators. Regardless of your industry, there are several professional organizations you can join. It is important to note that some associations do have specific requirements before you can become a member, and often they charge an annual fee to join. However, the industry knowledge you can gain from a professional organization is well worth the money. Even if you cannot attend the organization’s events, these groups often post exclusive job openings on their job boards. Let’s face it, we’re all guilty of submitting the exact same resume to dozens — even hundreds — of job openings. While sending the same generic resume to every relevant job opening on LinkedIn can help streamline the application process, it can hinder your chances of getting the job. Hiring managers can detect a template resume anywhere. After all, they encounter hundreds of them in just one hiring cycle. Although you likely have a LinkedIn profile, a LinkedIn account alone won’t get you noticed by employers. It’s important to make yourself stand out from other applicants by creating a website with your professional portfolio. While it might not be appropriate for everyone to create a professional website, you can also supplemental your LinkedIn profile with a blog. WordPress is an inexpensive and easy way to create your own industry-specific blog. Regardless if you choose to construct a website, a blog, or both, you could focus on the quality of the content that you publish online. Only display your best work examples and blog posts. Obtaining your first full-time job is all about credibility. While you could have a long list of incredible internships, hiring managers want to know if you are a dedicated and skilled worker. Although most applications require you to list three to five professional contacts, you can enhance your application with one or two letters of recommendation from past employers. It can become annoying if you ask your past employer for a letter of recommendation for a dozen different positions, so instead, you can ask for a general letter of recommendation in a specific career industry. While it might seem contradictive to have a vague letter of recommendation when your resume and cover letter is supposed to be very specific, the purpose of the letter is to highlight your capabilities as an employee and validate your trustworthiness. Given the purpose of the letter of recommendation, it isn’t vital for it to be specific for every job application. Unless, of course, you are applying to very reputable companies like Huffington Post or Google. Asking around is a great method to find job openings, especially those that aren’t advertised online. You can ask your family, friends, past employers, and professors. Granted, you will likely have more productive results if you ask someone who is working in the same or similar industry as you. Even if you don’t have any former employers or professors that you feel comfortable enough to ask for professional leads, you can always contact your university’s career services office. Granted, you shouldn’t create a dream board, because your entry-level job likely won’t be your dream job; however, it will help you acquire your dream job. Plus, your first adult job will be very enriching regardless. Nevertheless, it is important to create a schedule to ensure that you are actively applying to job openings. In your schedule, you should also remind yourself of application deadlines and set aside time to research each company so you can tailor your application materials appropriately. Though you may have many skills that you want to showcase to a hiring manager, it’s important that you specify only skills and experience relevant to the jobs that you are applying to. You should plan to search for jobs in two or three career paths. These jobs should fit your experience and skills. While you could want to go into writing, it’s important to know that writing (along with essentially every career) is a very diverse field. Therefore, narrowing your searches between editorial assistant/staff writer positions and associate copywriter positions will make it easier for you to mold your respective resumes to fit these jobs. Granted, you will edit your resume even further for each job opening. 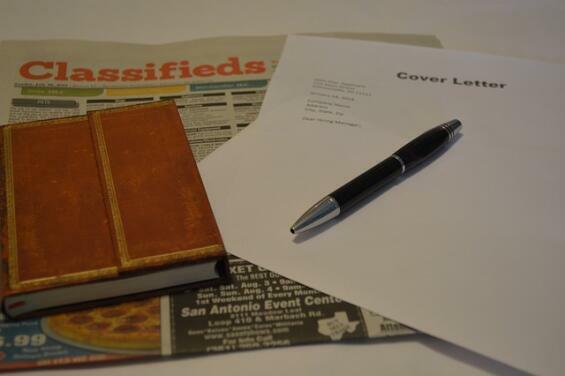 Refining your job search will also allow you to think of more specific examples to discuss in your cover letter. Rather than writing about your overall love of everything writing, you can elaborate on your experience writing branded content or curating content for a style blog. While most employers would love to hear about your side blogging business during your interview, it is best to leave any unnecessary fluff out of your application material for a specific job, because it can deter hiring managers from hiring you. After all, irrelevant experience in your application material, even if you have limited working experience, can make it seem like you aren’t focused on any specific career path. Hiring managers might think that you are still figuring out what you want to do with your career. If you present yourself as not being certain about your career path, your chances with a company will be slim, as the interviewer won’t believe you have longevity with their organization. To them, you could change your mind and switch career paths at any moment. Let’s face it, most companies want to invest in employees who also want to invest their time and skill into their company. I live in Iowa now, but I was born and raised in Florida. When I'm not writing, I'm probably drawing or cooking.